Heat oven to 325°F. In medium bowl, mix salsa ingredients (salsa will be juicy). Set aside. Meanwhile, microwave chicken as directed on package. In large bowl, mix mayonnaise, sour cream, 1/4 cup pineapple topping, the celery, onions and 1/4 cup of the cheese. Cut chicken into small bite-size pieces; add to mixture in bowl. Toss gently, coating chicken completely. 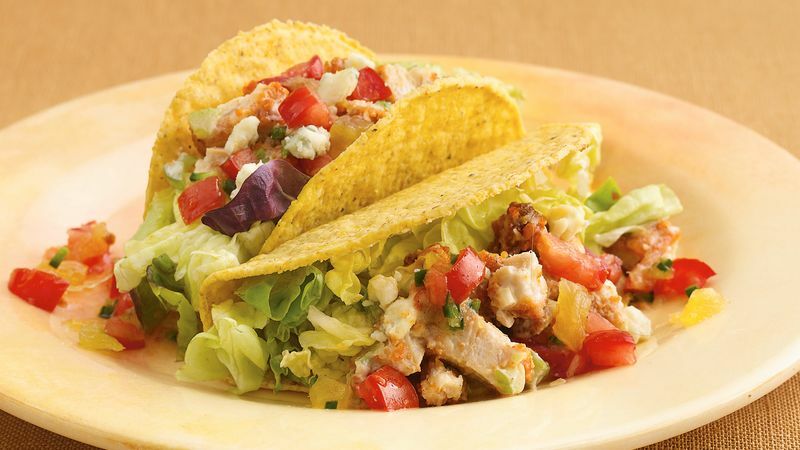 To assemble tacos, divide lettuce among taco shells. Top lettuce in each shell with about 1 teaspoon salsa and 1/4 cup chicken filling. Top with remaining salsa and 1/2 cup blue cheese. Serve immediately.